Recent release “ShareCropper” from Page Publishing author Naomi P Everett is a powerful tale of love and struggle that evokes feelings of joy, sorrow, fear, and empathy. Naomi P Everett, a hardworking writer whose experiences became the inspiration of her composition, has completed her new book “ShareCropper”: a moving story about a black family’s life - from being tenants of white-owned plantations, domestic abuse, to overcoming one’s fears, triumph, and understanding. Published by New York City-based Page Publishing, Naomi P Everett’s thought-provoking novella shows how people move past their fears, strive hard to make ends meet, and achieve a life of grandeur after what would seem as an eternity of torment brought about by overwhelming emotional, social, and physical trauma. 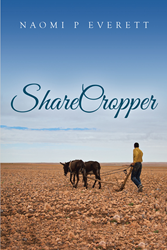 Readers who wish to experience this evoking work can purchase “ShareCropper” at bookstores everywhere, or online at the Apple iTunes store, Amazon, Google Play, Kobo, or Barnes and Noble.